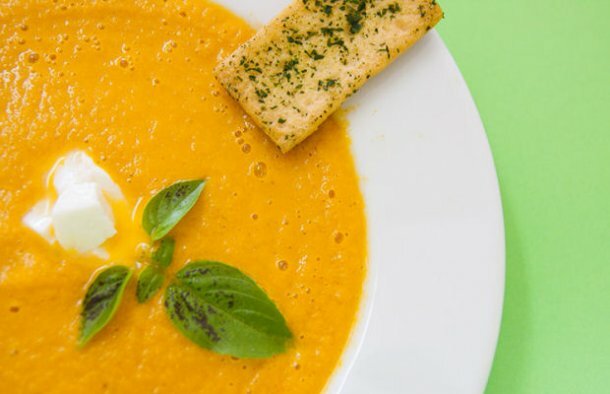 This delicious Portuguese cream of tomato with roasted vegetables soup recipe (receita de sopa de creme de tomate e legumes assados) is easy to make and also very healthy. In a baking dish, place the tomatoes (if they are very large, cut them in half), the carrot, the leek, the zucchini, the basil and season with salt and pepper to taste. Drizzle the vegetables very well with olive oil. Preheat the oven to 180°C or 350°F and let the vegetables roast for about 50 minutes. After the 50 minutes or when the vegetables are roasted, remove them from the oven. Place all the contents from the baking dish into a pan and heat. Add the chicken broth, once it boils, let it boil for 10 minutes. After 10 minutes, blend everything using a hand blender until it turns creamy. Serve with the Mozzarella cheese cubes and garnish to taste. 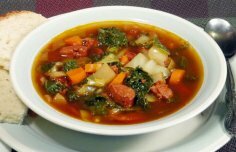 Learn how to make this delicious Portuguese chouriço and kale soup. 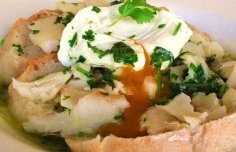 How to make Portuguese codfish bread soup (Açorda de Bacalhau). 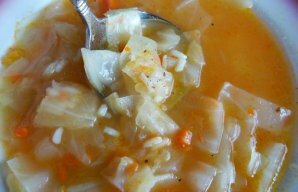 This Portuguese cabbage soup recipe is delicious, low calorie, packed with vitamin C, A, and is loaded with fiber.